Cutting-edge research from the University of Southampton’s Performance Sport Engineering Laboratory (PSEL) has contributed to British success in winning gold medals at the Olympic Games in Beijing, Vancouver and London. 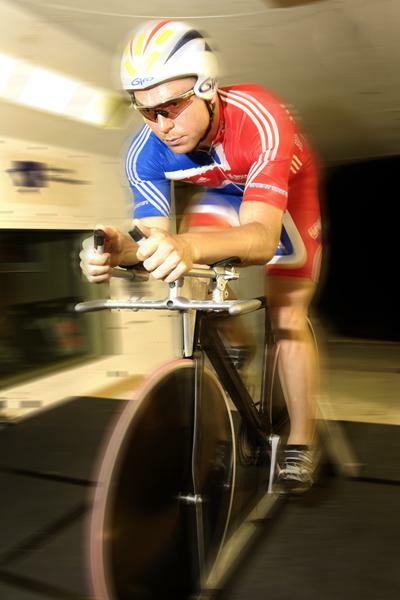 Notably, it involved the use of the University’s RJ Mitchell wind tunnel to support British cycling and the development of Amy Williams’ sled ‘Arthur’. The Laboratory’s academic expertise in fluid dynamics and instrumentation as well as its application to system design and equipment selection has supported UK Sport since 2005 and the development of motor racing and high performance yachts from the 1980s onwards. It was for these contributions that PSEL was awarded a Queen’s Anniversary Prize in 2012. The physics of how a cyclist can cut through the wind more easily or a skeleton slider can descend faster is easy to state but much more difficult to influence. The uncertainty of the competition environment coupled with the unpredictability of the human form results in an extremely challenging puzzle to solve. The PSEL team of academics, consultancy engineers and postgraduate students through their diverse research expertise in fluid and structural dynamics, simulation technologies and sports science has developed the necessary insight to cut through the complexity. It has contributed such expertise to the development of sails, hulls, keels and rudders on America’s Cup yachts, had a long-term impact on the aerodynamics of Formula 1 motor racing cars and become established as an international leader in performance sports engineering – supporting leading UK sportsmen and women. The University of Southampton has been working in partnership with UK Sport since 2005 to ensure the best performance and preparation for British athletes, working with sports including cycling, swimming, sailing, rowing, canoeing and wheelchair racing on the journey to 2012. Leading this team is Stephen Turnock, Professor of Maritime Fluid Dynamics. Stephen, along with colleagues in Ship Science, Mechanical Engineering and Aeronautics and the world leading engineers of the Wolfson Unit, an Innovation Partner to UK Sport's World Class Performance Programme, have built strong links with industry. Undergraduates and postgraduates have also benefited from first-class training in the specialist taught courses such as Yacht and Small Craft and Race Car Aerodynamics. The margins of victory in elite sports can be as little as a hundredth of a second. PSEL concentrates on sports where there are potential gains in the aerodynamic and hydrodynamic characteristics of the athletes and their equipment. The team at PSEL is immensely proud to be recognised by UK Sport as providing services that meet the world-class standards of excellence in performance science and innovation required to make an impact on the UK’s best athletes and coaches. Many of the UK’s Olympic medallists since 2008 have received crucial advice from Southampton’s team of specialists during their training. There are many success stories, PSEL EngD research students, Rachel Blackburn and James Roche developed ‘Arthur’ - Amy Williams’ bob skeleton sled which sped her to a gold in Vancouver in 2010. Their work continues as both now work for a leading F1 technology team. Since the run up to the Beijing Olympics and on the journey to London, members of the British cycling team including Sir Chris Hoy have worked closely with Dr Sandy Wright and Dr Martyn Prince. Both Wolfson Unit research engineers are members of British Cycling’s ‘secret squirrel’ club led until 2012 by Chris Boardman. The success on the track has inspired British Cyclists to a first win for 46 years of the road world championship (Cavendish, 2011) and back-to-back triumphs in the Tour de France Wiggins (2012) and Froome (2013). The achievements of Britain’s Olympic athletes have raised the international profile of British engineering excellence and helped inspire greater public participation in sport. Through a collaboration with the University, cycling commentator and 2004 Olympian Chris Boardman gave an inspirational lecture at the University to 300 17 year-olds from local schools. This positive publicity motivates school pupils to study engineering at university and many applicants for Southampton’s engineering programmes quote Formula 1, sailing and cycling as reasons for applying. In the longer term they achieve their dreams with many America’s Cup and F1 teams relying on engineering excellence delivered by our graduates. Scarponi, M., Conti, P., Shenoi, R. A., & Turnock, S. R. (2008). Interactions between yacht-crew systems and racing scenarios combining behavioural models with VPPS. International Journal of Small Craft Technology, 150(B1), 11-18. Molland, A. F., & Turnock, S. R. (2007). Marine rudders and control surfaces: principles, data, design and applications. Oxford, UK: Butterworth-Heinemann.